You’ve done it! You’ve got your WooCommerce-enabled WordPress site up, full of all the great products your business offers. It’s functional, simple, and it does the job. But, there’s a problem! Your store has so many items in it that it’s getting hard for customers to easily find what they want. You may offer several variations on a particular product, meaning customers aren’t sure which is the right one for them. Your store might have exactly what a particular customer has come looking for. But, there’s just too much stuff for them to sift through that it’s starting to affect your conversion rate. Low conversion rate? Customers struggling to find precisely what they want? This is where the WooCommerce product comparison table plugin comes in. 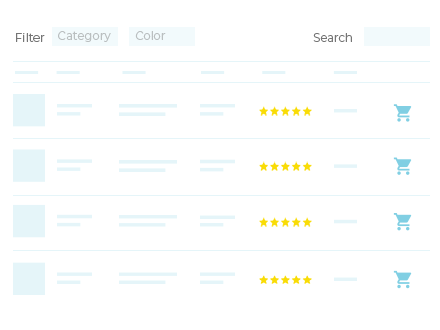 A WooCommerce product comparison table plugin, like the one above, lists products in a way that makes it easy for customers to find what they’re looking for, and to compare similar products. The aim is to present products alongside each other so that customers can make direct comparisons and quickly and easily choose which ones to buy. What’s wrong with most WooCommerce product comparison table plugins? The WooCommerce product comparison table plugin market is crowded, and we won’t pretend there aren’t plenty of products available. These often let customers tick 2 or more products and then view them on a separate page. You might also come across static table plugins where you have to manually enter the data. Don’t have features to help customers find products to compare in the first place. Show the product comparisons in the same layout as the rest of the store, instead of having a dedicated comparison table. Contain very little product data in the tables – usually image, name and price. You can add extra data if you create comparison tables using a static WordPress table plugin, but you have to enter everything manually which is no good. WooCommerce Product Table is a different type of product comparison plugin. It automatically lists products in a searchable, sortable table layout with filters. You can add columns of extra product data to the comparison table, letting customers compare products in a more meaningful way. 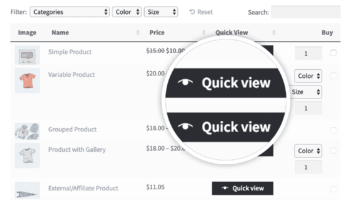 And if you use it with its sister plugin – WooCommerce Quick View Pro – then you can even add quick view options to your comparison tables. Create a WooCommerce Product Comparison Table Plugin on your site now! How does the WooCommerce comparison table work? WooCommerce Product Table is highly flexible and there are many ways to configure your tables. Used correctly, it functions perfectly as a WooCommerce comparison table plugin. Demo: See the WooCommerce comparison table in action! Customers will view a page on your website with products listed in a table. The table provides several ways to find the products to compare. They can type a keyword into the search box. The filter dropdowns above the list – and/or filter widgets in the sidebar – make it easy to refine the list. They can sort the table by clicking on any column header. Customers can even filter the table by clicking on a category, tag or custom taxonomy term. As the customer filters the table, the number of products listed will decrease until they can just see the products they want to compare. This works slightly different from some WooCommerce product comparison table plugins, because you are filtering the table instead of ticking boxes. It’s a neat way to do it because this helps customers to find suitable more products more quickly, instead of having to scroll through a long list of products. You can include as many columns of product data as you like in the table. Each product takes up 1 row in the table, and customers can easily view the data for each product and make direct comparisons. For example, if you’re selling smartphones and want to compare the storage capacity, then you can include a ‘Memory’ column in the WooCommerce comparison table. The product of all of this is customers are able to find what they’re looking for much more quickly. This feeds in to a higher conversion rate, and in turn more sales, revenue, and profit for you. Universal Fans sell a wide range of fans to retail and the trade. They have used the WooCommerce Product Table plugin to create a WooCommerce comparison table for their exhaust fans. This helps customers to find the right fan for their needs, based on a range of technical data. The comparison table page consists of 4 tabs, each containing a product table listing a specific type of fan. The comparison table includes columns for SKU, image, name, price, plus several product attributes containing technical data. Each column in the table is sortable. Customers can also filter by duct size or perform a keyword search. To allow more space for the product comparison data, Universal Fans have decided not to include buy buttons in the table. Instead, customers can click on any fan to access the single product page where they can choose options and buy. As you can see, WooCommerce Product Table is the perfect product comparison table plugin for a site like Universal Fans. Next, I’ll show you how to create comparison tables for your own WooCommerce store. WooCommerce Product Table only takes a few minutes to set up. You don’t need to do any data entry or custom coding. Assuming you already have a WooCommerce site with products, it works instantly and lists your existing products in a neat comparison table. Watch the video tutorial, or read the detailed written instructions below. First, get WooCommerce Product Table and install the plugin. Activate your license key using the instructions in the confirmation email. Next, go to the page where you want to add a WooCommerce product comparison table. You can also create a new page, if you prefer. Finally, add the shortcode [product_table]. This will list all your products in a comparison table. Customers can perform a keyword search and sort each column in the table, but there are no filter options at this stage. The section above covers how to list all your products in a basic comparison table with filters. 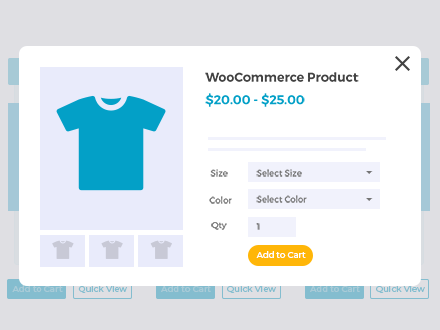 By default, the WooCommerce table plugin comes with some standard columns of data – name, short description (summary), price and “add to cart” buttons. This works pretty well in and of itself as a product comparison table. However, the WooCommerce comparison table plugin comes with lots of options to configure your tables so you can make it even easier for customers to refine the list and compare products. Our knowledge base is full of detailed specifics on how to tailor the plugin to suit your needs. To get you started, in this section I’ll summarise the main options that will help you create fantastic comparison tables. You can see a product comparison table on our demo page. By default, the WooCommerce product comparison table lists all the products in your store. This is ideal for many types of comparison shopping, because customers can view the full list and use the filters to refine it according to their interests. However, if you sell different types of products, then you might want to provide multiple comparison tables listing different categories. For example, it’s unlikely anyone would want to compare t-shirts and shoes in the same clothing comparison table, so it’s best to list these separately. Fortunately, WooCommerce Product Table can be used to create tables listing specific products only. You can create comparison tables with products from a certain category, tag, or even products with a specific custom field or taxonomy value. If you add filters=”true” to the product table shortcode (as I did in the example above), it will show some default filters for your products. You can have much more fine control over how customers can narrow down the list of products in the comparison table. For the filter dropdown lists above the table, you can choose which filters appear. You can also add extra data within filters, such as product attributes, variations, product add-ons, and custom taxonomies. The comparison table plugin also comes with built-in filter widgets. These replicate the widgets that come with WooCommerce itself, but are designed to work with the product tables. If the page with your comparison tables has a widgetized area such as a sidebar, then you can add widgets to refine the list by attribute, price, or rating. 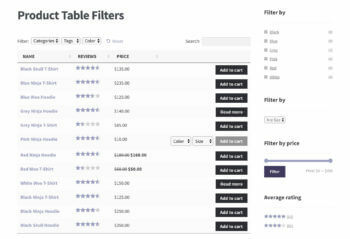 Check out our knowledge base article for full instructions and examples of all the filter options for your WooCommerce product comparison tables. Sometimes, you want customers to be able to access more information than you can fit into the comparison table. But the dilemma is that you want to keep them on the product comparison table, and not direct them to a separate page for each product! That’s because you want them to add multiple products to the cart, not just buy one product! The solution is to use WooCommerce Product Table with our other plugins, WooCommerce Quick View Pro. This adds quick view buttons and/or links to the WooCommerce product comparison tables. Customers can view extra product images and information, choose options and add to the cart, from a quick view lightbox window. This is a great compromise because you can show extra information without taking customers away from the comparison table page. The great thing about using WooCommerce Product Table for your comparison tables is that it gives you full control over the displayed product data – and you don’t have to edit any code to do it! You can choose exactly which columns are included in the product comparison table. The plugin supports all the standard WooCommerce fields that you fill in when you add new products. It also supports extra fields such as product attributes, variations, product add-ons (if you’re using the WooCommerce Product Add-Ons plugin), custom fields and taxonomies. This creates an opportunity to create much more useful WooCommerce product comparison tables, which isn’t possible with other plugins. Make the most of it by planning your columns carefully! If people will be comparing the price of your products, allow easy price comparisons by including a price column. And even better, use the price filter sidebar widget. Use columns such as weight and dimensions for items such as furniture, where customers are buying based on size. Adding product attributes allows for direct comparisons of information such as size and colour (or whatever you like!). List each attribute as a column in the comparison table. Add each attribute type as a filter above the table, or use the built-in filter widgets. Use WooCommerce custom fields and taxonomies to store extra data about your products and list this as columns in the table. This can include additional technical data that you’re not storing elsewhere. The default WooCommerce comparison table includes standard “add to cart” buttons. If you prefer, you can replace these with checkboxes so that customers can add multiple products to the cart at once. If you don’t want customers to purchase directly from the comparison table, then you can remove the add to cart column altogether. With that in mind, it’s a good idea to include a stock column in your product comparison table. WooCommerce Product Table supports WooCommerce stock levels. Simply add a ‘stock’ column to the table. Customers can make sure the products they’re comparing are in stock, to avoid frustration. Lots of WooCommerce websites make money by providing helpful comparisons of products sold by third party websites. Each product has an affiliate link. This earns the website owner a referral commission if the customer clicks through and buys the product from the other website. You can easily create affiliate product comparison tables without adding any further plugins. WooCommerce has a built-in product type called External/Affiliate Products. You add products in WooCommerce as usual, but select this product type and add your referral link to the affiliate product. WooCommerce Product Table fully supports External/Affiliate Products. Your affiliate links will appear in the WooCommerce product comparison table instead of add to cart buttons. Sites with many types of products in a WooCommerce comparison table plugin (e.g. 100s or 1,000s of products), can activate lazy load to prevent any performance problems. This loads 1 page of products at a time, so your site will never crash however many products there are to compare. You can make your WooCommerce product comparison tables more eye-catching by adding icons or content added by other shortcodes. For example, you could use icons to represent the different features of your products, instead of listing features using text. This lets customers compare products more visually, as they can instantly see which features are available in each product. Tip: To get this working, you might need to add shortcodes=”true” to the product table shortcode. This tells the comparison table to render any code correctly in the table, instead of just showing the code. So far, I’ve talked about how to create a WooCommerce comparison table to compare actual products. If you prefer, you can use the instructions from this tutorial to compare product variations instead. To do this, you need to use the option to list each variation as a separate row in the table. Your customers can use the filters to refine the list of variations in the table, and then compare the ones they’re interested in. WooCommerce Product Table is the perfect plugin for comparing products. By listing your product data in a structured table or grid view, customers can make direct comparisons and decide which product to buy. Customers are able to filter products so they only see items directly related to their purchase intent, and the ability to include stock status and add-to-cart options directly in the comparison table itself will directly impact your conversion rate. 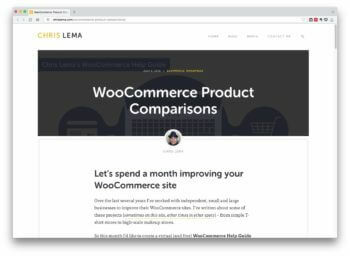 This post has covered the exact steps you need to take to increase your sales with a WooCommerce product comparison table plugin. All you need to do now is put this into practice, and watch the sales come in. I had no idea WooCommerce had such a useful feature like the product comparison table plug-in. When a business is looking for the best platform for their site, usually they need to compare magento vs woocommerce. The product plug-in features definitely increase WooCommerce's chances. The customers will appreciate such a clear layout.